For the second year in a row, our North Tustin Cheerleaders have won first place in the Southern California Regional Championship! 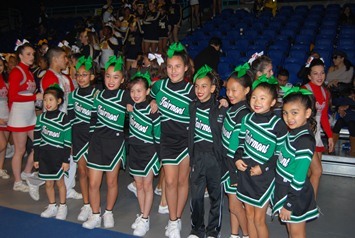 Now they will move on to the state and possibly national level to continue competing. We are wishing them lots of L-U-C-K! The spirit of the holiday season is underway, and our Annual Toy Drive kicked off this week. We would appreciate if you could help us by donating a toy for a boy or a girl who is at CHOC - Children's Hospital of Orange County. These children would truly benefit from receiving a special gift on Christmas morning and all year long. You can drop your donation off at your campus now until December 14th. The toys will be picked up by the Orange Coast Harley Davidson's Chapter. They will come to all of our campuses on Friday, December 14th via motorcycles! Thank you in advance for your kindness and generosity. 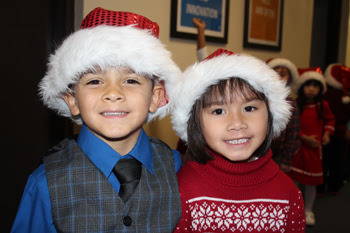 The holidays are just around the corner, and our campuses are all abuzz with holiday cheer! Our annual winter concerts have begun, and they've been a great success so far! You can read re-caps of the 1st and 2nd Grade Performances at the Historic Anaheim Campus and the Preschool Sing Along at the Anaheim Hills Campus (pictured above) in this week's newsletters. We still have lots of performances coming up! Check out your campus' newsletter for the dates and times.